John Harle's saxophone playing is what provides the thread which runs through the whole album, and no one who has heard him before will need to be told what fine, alluring silk that can be made of. "The double-think of the medieval mind" is John Harle's definition of "Terror and Magnificence", the title he gives to this album pulling together some of the strands of his recent projects as composer and saxophonist. The clearest medievalisms are in the album's two most substantial and ambitious pieces. The title-track, a 20-minute meditation on a text by Machaut, originated in an improvisation Harle recorded in Christchurch, Spitalfields, for BBC 2's programme The Score. Machaut's words, says Harle, "mirrored the gut feeling" he experienced in the church, and are spoken by an actor over an ever-changing, essentially unmelodic accompaniment from saxophones, keyboards, percussion and an appropriately medieval-sounding chant choir. Although Harle cannot resist illustrating certain individual words such as "cantus", "estampie" and "hoquet" fin a manner irresistibly reminiscent of Mike Oldfield's Tubular Bells), his approach is mainly one of broad atmospherics; the section depicting the terrified anguish of the sinner is fearsomely effective, and the piece ends in an exhilarating wash of multitracked saxophones (40, according to the programme-notes). Rosie-Blood is a more active piece, based as it is on Pêrotin's four-part organum Sederunt principes. Harle does not alter it much; countertenor William Purefoy sings one part while a male choir chants the drone-like lower line, eventually to be joined by discreet saxophones on the remaining parts. Nothing is really added in the way of melodic material, but a lightly varied accompaniment is stirred in, ranging from driving drums to throbbing bass clarinet. Rosie-Blood first saw light of day as The Prince's Verdict at the 1995 South Bank Meltdown Festival, and it is that event's co-ordinator, Elvis Costello, who turns up to sing Mistress Mine, three songs Harle composed in 1994 for a production of Twelfth Night. Despite a squealing saxophone prelude they are pretty gentle stuff; Costello — close-miked and with plenty of vibrato—is a touching presence who manages to instil the music with a truly haunting English melancholy. Also memorable is Sarah Leonard's boyish, occasionally stratospheric contribution to The Three Ravens, another song-cycle, this time to traditional English texts. As in the Shakespeare settings, the actual melodic material here is somewhat stilted, but helped out by resourceful accompaniments from members of Harle's band. In the end, though, it is Harle's own saxophone playing which does most to keep everything afloat, and in so doing provides the thread which runs through the whole album. And no one who has heard him before will need to be told what fine, alluring silk that can be made of". "The gorgeous reworkings of three Old English songs sung by a totally credible Elvis Costello are only the most conspicuous highlights of classical saxophonist John Harle's latest genre scramble, Terror and Magnificence. Harle combines all manner of classical, jazz, and pop players, but his own commanding musicianship and audacious composing act as this record's solid cement". "I have the original Argo release of this recording. And quite frankly this album was one of the jewels of the Argo crown. It is an album that I cannot simply imagine being without, having lived with it for several years. There is not one single duff track here, but the highlight for me has to be the eponymous title track which uses texts by 14th century composer Guillaume de Machaut which he usese to intensify (totally successfully) his evocation of a 'mediaeval mind-set'. The music has a dramatic sweep that leaves one breathless at the end. But also don't miss Elvis Costello singing songs from texts taken from Shakespeare's 'Twelfth Night', these are utterly beguiling settings; as indeed are the anonymous Tudor lyrics of the ' The Three Ravens' settings sung so beautifully by Sarah Leonard. To add to this heady brew you have to add the magnificent soloing by John Harle and his parner-in-crime Andy Sheppard plus the backing by Hohn Harle's band and the Balanescu Quartet plus Terry Edwards (try listening to his Xenakis CD or the Stockhausen Engel Prozessionen he conducted) and his London Voices. If I could give more than 5 stars for this recording I would, but all I can say is give it a chance... I can't imagine you would ever regret it". 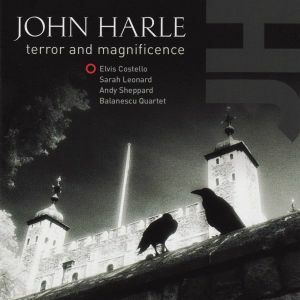 "John Harle's Terror + Magnificence album will transport you hauntingly and melancholy and beautifully outside yourself . Many times listened to, Elvis Costello, becomes an extremely credible medieval minstrel - with that feeling of having come off the dusty track to regale you with say 'Mistress Mine', all the more convincing as he struggles to get his tongue round the challenging Shakespearean lyrics - hard to think who could emulate that style better. The title work will tear you to pieces with its occasional disharmonies and dissonance; you will feel to applaud the when the foot-tapping dance rhythms catch your heart and toes in great relief - watch out you might actually get up and dance... such is the joy. Sarah Leonard's immaculate voice carries you through 'Since first I saw your face' to 'How should I my true love know?' (music to make love to??) and you must keep hearing them, the same goes for William Purefoy. This leaves John Harle's amazing saxophone; personally I love best when his instruments melt seamlessly into voices. All in all: PLEASURE!!!"